An introductory section explain the genesis and concept of a series of books. The idea was to produce a series of books at the cutting edge of identification discoveries. Some of the material is new and relatively untested. A challenge is laid down to readers. Go out and test these ideas. Watch birds closely and more carefully and make your own discoveries. This is the first in the series focusing on the season of AUTUMN. Most birders go out into the field knowing roughly what might be encountered in a given season and not needing all the information on all species pertaining to the whole year. So the Challenge series begin with a number of AUTUMN ‘challenges’. Over 40 taxa are covered in 18 Chapters ranging from Hen and Northern Harriers, Wilson’s and Common Snipe, Pallid and Common Swift and Siberian and Common Chiffchaff, to potential vagrants like Sharp-shinned Hawk and Yellow -streaked Warbler. There are the new splits such as Cabot’s and Sandwich Tern, 3 Subalpine Warblers, 3 Lesser Whitethroats and 6 stonechat taxa. Each ID challenge is presented in a concise and accessible form with accompanying photos, illustrations and sonograms where appropriate. 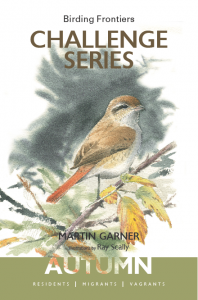 “Martin Garner’s challenge series is certainly the way forward in the field of identification. Focusing on problem groups and pairs, it presents all the information needed, much of it new and previously unpublished, in a succinct, uncluttered and clear text with no waffle. This is enhanced by carefully chosen photos and Ray Scally’s accurate illustrations. This book questions and delivers and Martin’s engaging text will stimulate. Destined to become highly collectable.” Ian Lewington.